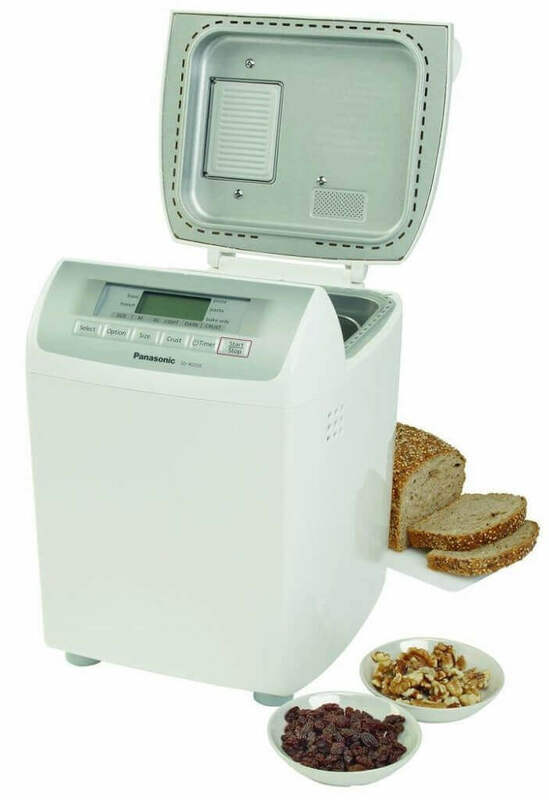 Both bread machines feature a fruit and nut hopper but they also have curious limitations in some aspects. 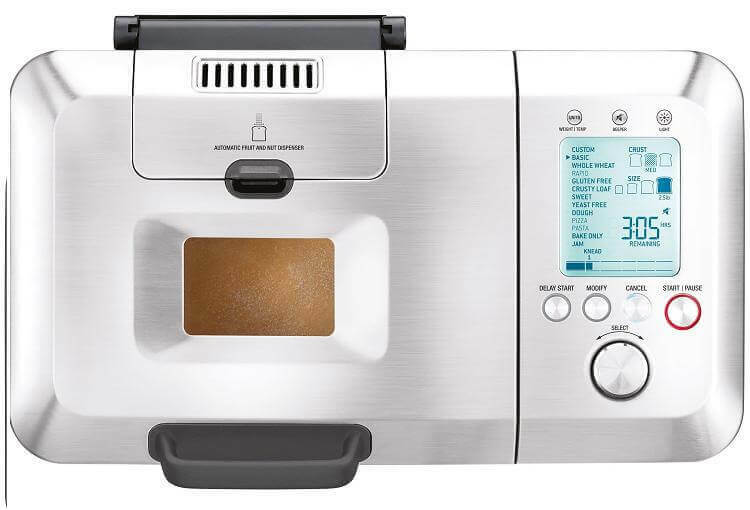 If you’re someone who likes to make fruit and dessert breads with nuts and/or fruit you might appreciate a bread machine that adds fruits and nuts automatically. 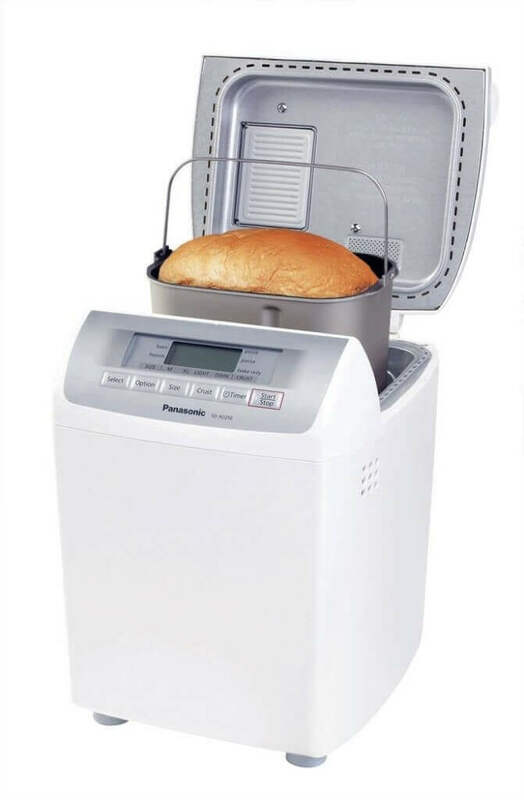 Most bread machines require you to wait until the initial kneading cycle and then add the fruits or nut at a beep that sounds at the end of the cycle. The automatic fruit and nut dispenser adds these ingredients automatically at the appropriate time. A common lament for owners of any bread machine with a fruit and nut hopper is that the fruits sometimes stick to the sides of the hopper and fail to empty into the bread pain. This is particularly true for stickier fruits like raisins and dried or candied fruits. The simplest solution is to toss the stickier fruits in some flour before adding them to the hopper. There’s quite a contrast between these two machines when it comes to settings. The Breville offers 13 settings including gluten-free and whole wheat plus numerous way to customize settings. Conversely, the Panasonic only offers 5 settings and those 5 settings do not include jams and jellies, gluten-free or whole wheat. However, owners report that it does a fine job with basic breads and dough. That sounds good but how does just about every other bread machine on the market deliver the same results with a viewing window in place? That’s up to you to decide. Be forewarned that lifting the lid to peek too frequently can cause problems especially during rising cycles. 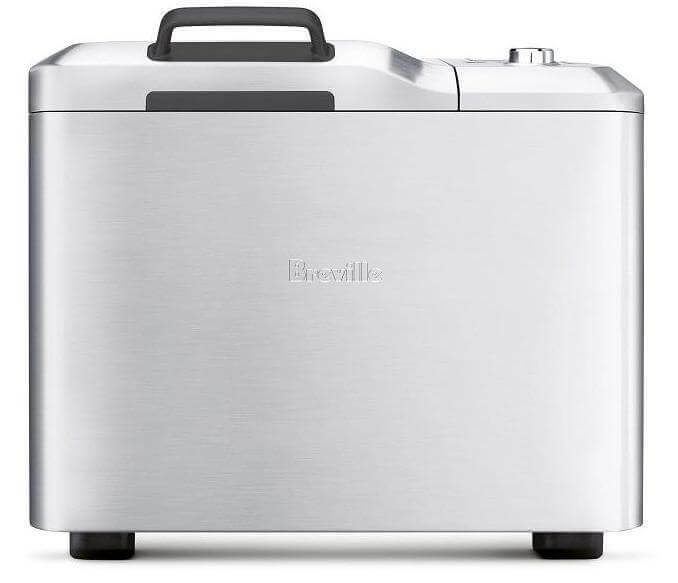 The Breville has the capacity to make a very large, 2.5 pound loaf. Curiously, there is a pattern of owner complaints about the small size of the fruit and nut hopper. It seems contradictory to offer the ability to make a very large loaf, but not enough room in the hopper to add sufficient amounts of fruit and nuts for a loaf of that size. There were no comments about the size of the Panasonic hopper although it has only a 2 pound loaf maximum compared to the Breville 2.5 pound loaf maximum. The Panasonic is also identified as having a removable hopper that is easy to wash. Some people don’t like the fact that the kneading paddle leaves a large hole in the base of loaf after it is baked. Breville’s solution is collapsible paddle that unfolds during the kneading cycle and then collapses to leave a smaller hole. According to some Breville owners the paddle often fails to collapse and the result is a larger hole in the bottom of the loaf than they would have seen with a fixed paddle. If the hole from the kneading paddle is a significant concern or yours, you might want to try the collapsible paddle option. Then again, you could always remove the paddle after the kneading cycle but be careful. Some settings have multiple kneading cycles in between rises and if the paddle is removed too soon you may not get a good result. Here are some highlights to allow you to see a direct comparison of features and specifications. While there is a significant price difference, you get what you pay for. The Breville has more settings and other features but problems with the collapsible paddle and the small fruit and nut hopper are worth considering. The Panasonic is a good, basic machine but lacks a viewing window in the lid and has very limited settings. Generally, owners of both of these machines are satisfied with their results. 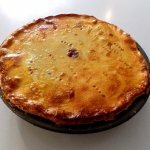 It all depends on the type and complexity of baking that you want to pursue, and the assumption that you want the automatic fruit and nut hopper.